Looking for high quality, serious, fun Pilates in Paris? 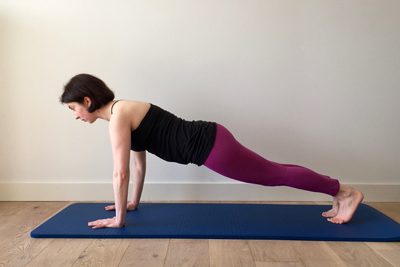 Emily offers Pilates mat classes for all, as well as for pregnant and postnatal women and private and duet lessons on Pilates equipment in Paris 11 and Paris 7 also! Pilates is an exercise method designed to decompress the spine, improve breath and circulation, and strengthen the entire body as a whole with a specific focus on the "core" abdominal muscles. Pilates can be done on mats or on equipment specifically designed by Joseph Pilates mainly the Reformer, the Wall Unit or Cadillac, and the Chair. Other smaller pieces of equipment and accessories such as Magic Circles, Fit Balls, Therabands and more can also be used. Emily teaches group classes on the mat with and without accessories and offers private and duet lessons on the mat and the equipment. Who is Emily - Pilates from head to toe? Emily is an American living in Paris since 1999, a mother and a former Internet Project Manager who trained extensively for her second career as a classical Pilates instructor. She has been teaching Pilates in Paris since 2010. Emily's goal as a Pilates instructor is to help each person feel more at home in his or her own body, to understand how it functions best and how to keep it strong and healthy for the long term. Emily loves teaching all kinds of people but has a special niche teaching pregnant and post-natal women. What is a session with Emily like? Group classes are small with a maximum of 9 participants. Emily is warm and friendly and makes each person feel welcomed by her and in the group. Be it a group or a private session every session begins by checking in with each person's current physical and mental condition. Emily teaches from the classical Pilates repertoire and introduces new concepts and exercises progressively. Imagery, anatomical knowledge and hand usage for guidance are used as pedagogical tools for teaching each lesson. She makes you work hard and she usually gives homework: an exercise or an observation to do until the next class! Emily is a member of The French Federation of Professional Pilates Practitioners (FPMP) and holds a CQP-ALS certification for teaching Pilates in France.